Acids are mostly used for home cleaning and certainly your stomach is not your kitchen sink. The modern diet, which is greatly influenced by today’s hyped up media and enslaving consumerism, is very acidic. Has there been any ad on TV, in magazines or on the internet that encourages buying vegetables and fruits? No, because they all push-sell packed or bottled products that do not match the natural processes in our body. Enterprising and consumerism has gone overboard in destroying our health. Everything, living or non-living, is either acidic or alkaline. However, humans are creatures made to consume alkaline foods and stand as an alkaline organism in the food chain. Our blood’s pH level is pretty much determined by the food we eat. And with our blood being non-alkaline, or simply, acidic, our body will poorly perform and will have difficulty in resisting the harsh effects of oxidation and disease-inflicting viruses. Top 10: Avocados, Bananas (ripe), Berries, Carrots, Celery, Currants, Dates, Garlic. These foods are very high in antioxidants. They have a pH value of 8.0. They chemically react to acidic foods of pH 5.0 and elevate them near the alkaline levels. Berries, dates and especially garlic have special properties that regulate blood pressure as well. Top 9: Apples (sweet), Apricots, Alfalfa sprouts. These ones are super digestible foods, which are high in fiber and have a pH value of 8.0. They are also rich in enzymes that are helpful in maintaining the body’s hormonal balance. Surely, an apple a day keeps the doctor away! Don’t forget to include apricots though. For those who do not know, Alfalfa sprouts are those sprouting seeds of beans that are commonly mixed in salads and sandwiches. Top 8: Grapes (sweet), Passion fruit, Pears (sweet), Pineapple, Raisins, Umeboshi plum, Vegetable juices. At a pH of 8.5, this group is also high in antioxidant and vitamins A, B and C. Grapes, raisins and plums are blood-regulating, which lowers blood pressure and risks of getting heart disease. Pineapple, on one hand, is rich in L-Carnitine, which uses body fat as an energy source and is good for trimming that growing waistline. Vegetable juices, on the other hand, are high in iron and good for cellular detoxification. Top 7: Chicory, Kiwifruit, Fruit juices. They have natural sugar that doesn’t form acidic compounds during digestion. 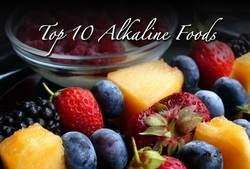 Rather, these foods have alkaline-forming properties that give more energy to the body. Still at a pH level of 8.5, this group is rich in flavonoids, a chemical compound in natural foods that have antioxidant properties. Kiwi fruit even has higher Vitamin C content than oranges. Chicory, a bitter-tasting close relative of the lettuce, also has insulin that supports the pancreas and aids the body in preventing diabetes. Top 6: Watercress, Seaweeds, Asparagus. With a pH level of 8.5, this group is unique as a powerful acid reducer. Watercress, for example, is called the natural super food. It is the first leaf vegetable consumed by human beings and is commonly prepared as part of a healthy salad. It is best eaten raw and it contains lots of iron and calcium like seaweeds. Asparagus is even more special for its highest content of asparagines, an amino acid important to the nervous system. Top 5: Limes, Mango, Melons, Papaya, Parsley. This food group has a pH of 8.5 and is best at cleansing the kidneys. Papaya is even the healthiest laxative that promotes defecation and colon cleansing. Parsley, the most popular herb, is the best dirt sweeper of the intestines when taken raw. It is also a diuretic, which is necessary in cleaning the kidneys. Limes, mangoes and melons are vitamin-rich fruits that are alkaline-forming during digestion. Top 4: Cantaloupe, Cayenne (Capsicum). The group with the most alkaline reactive properties among the foods with the pH of 8.5, they are high in enzymes needed by the endocrine system. Cayenne has antibacterial properties and is also high in Vitamin A, which is essential in fighting free radicals that causes stress and illnesses. Cantaloupes, a relative of melons, is very low in sugar but high in fiber. Still with a pH of 8.5, Agar Agar is a gelatin substitute made from seaweeds that is high in iron and calcium as well. It is very digestible and has the highest fiber content among all foods. At a pH level of 9.0, Watermelon are very alkaline. Because of its high fiber and water content at 92% of its entire weight, watermelon is a mild diuretic and a great source of beta-carotene, lycopene and vitamin C. This thirst-quenching fruit is the most life and energy supporting food when used in a week-long fasting and colon cleansing. At the top of the list is the Amazing Lemon. With its electrolytic properties and a pH level of 9.0, lemons are considered the most alkalizing food. It is the most potent and most immediate relief for colds, cough, flu, heartburns, hyperacidity and other virus-related ailments. Lemons are natural antiseptic that disinfects and heals wounds. It is also the best liver tonic that detoxifies and energizes the liver.